LOVING this Bella - 10.5" x 20" Ceramic Copper Titanium Electric Griddle $17.99 (Retail $39.99)! 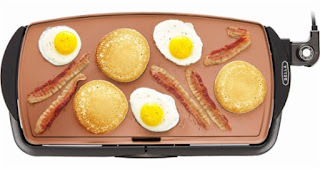 Make sumptuous breakfast feasts with this BELLA copper griddle. Its durable ceramic coating lets you cook up to 30 percent faster than traditional nonstick surfaces, and its titanium-reinforced finish helps it withstand contact with metal utensils. The large cooking surface of this BELLA copper griddle lets you cook up to 10 eggs at once.